Over the last 3 weeks Andy & I have covered nearly 2000 kilometres & climbed nearly 26 kilometres between us on our bikes. 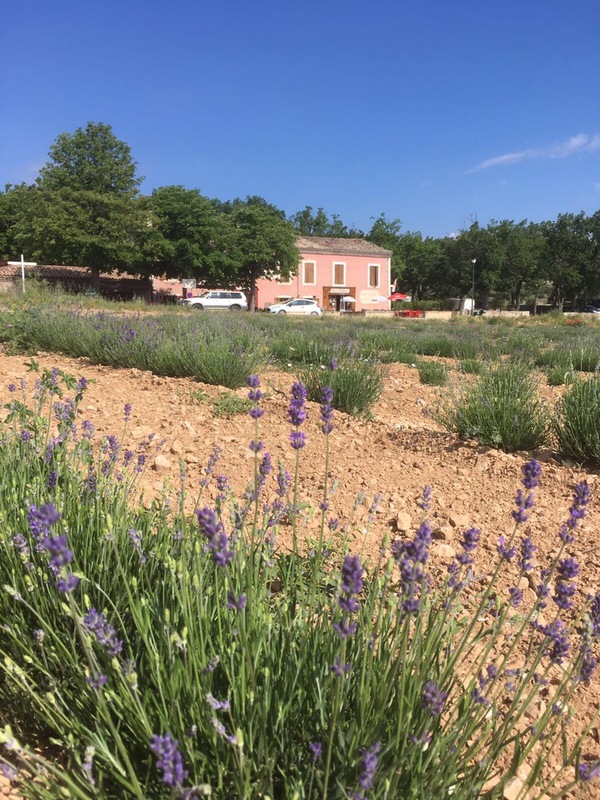 …..And it’s amazing just how far we’re willing to go for a good cup of coffee & a decent croissant, so I thought I’d share some of our favourites. 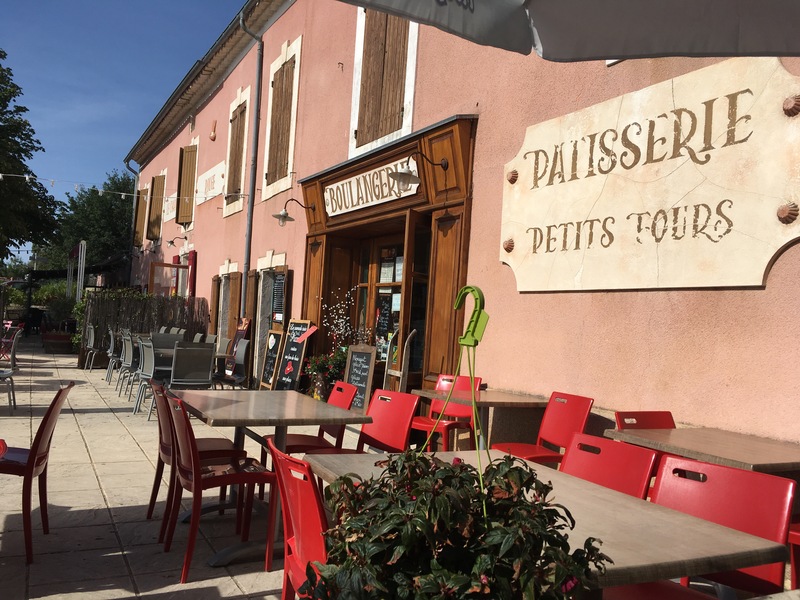 These may not be the best Boulangeries or cafés in the area, but they are friendly, welcoming and perfectly located for us to feel we’ve earned the stop & sugar boost by the time we get there! 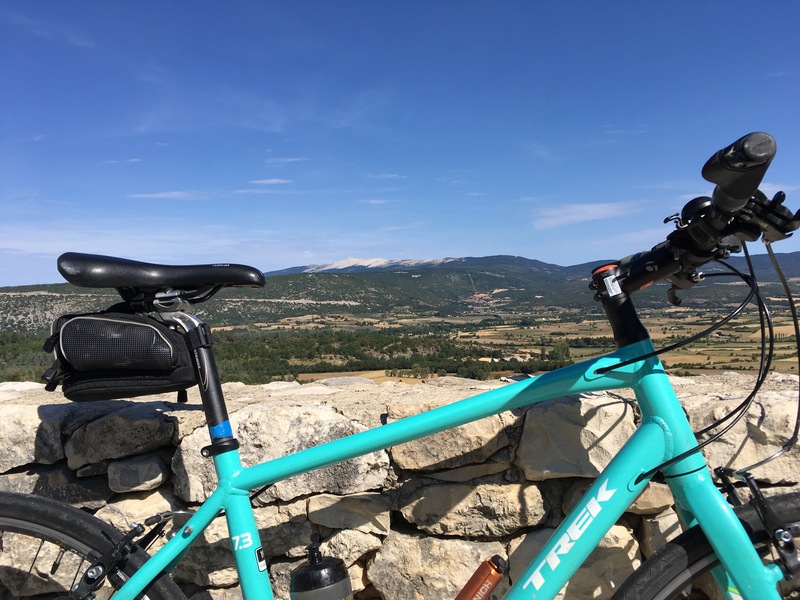 I can’t say that the cycle to Simiane is the easiest – effectively it’s an hour’s uphill ride from us, but it is always worth the effort and happily means that it’s pretty much downhill all the way back, whichever way we decide to go. 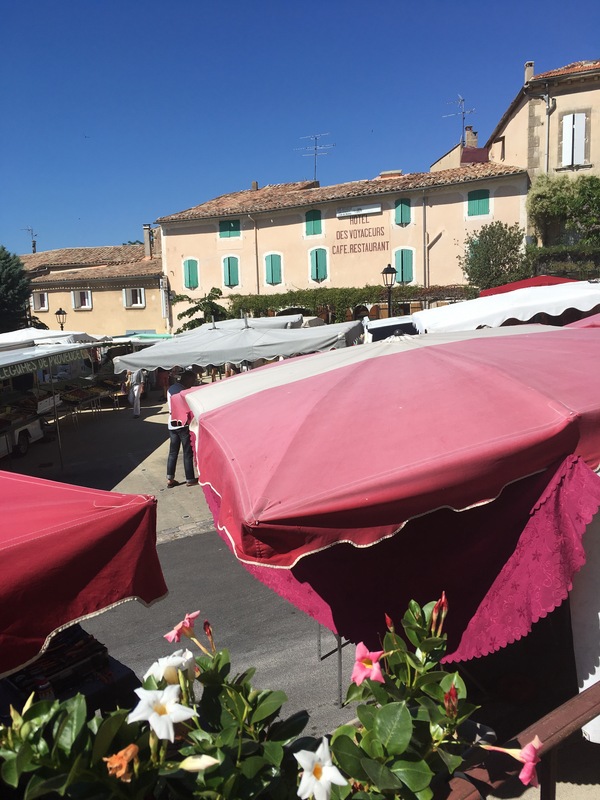 The Boulangerie is open in the morning till 12 (closed on Mondays) and is situated by the side of the main road that runs on towards Banon. In the early summer the fields opposite are filled with lavender & the terrace at the front is a lovely place to sit. 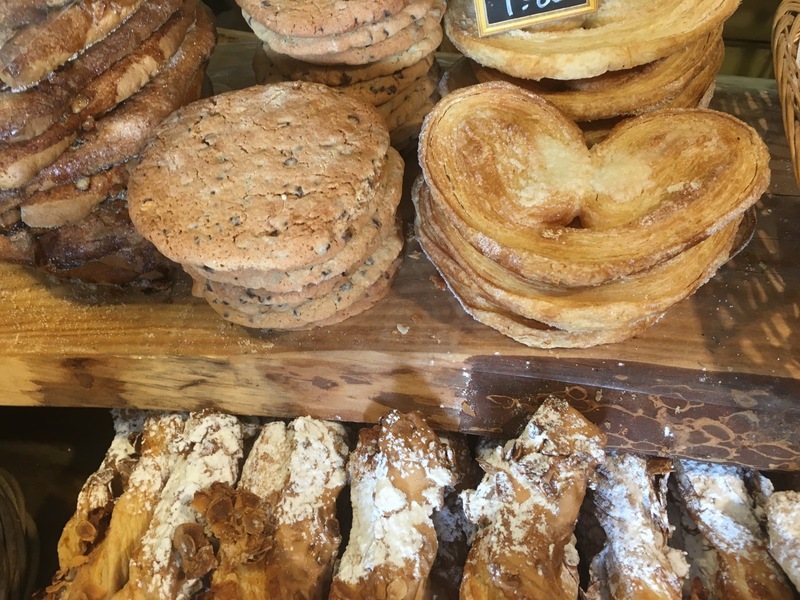 Walking in to the shop is always a pleasure, with a tantalising display of breads, pastries, biscuits and chocolate to tempt you, all set against the backdrop of the wonderful old bread oven. 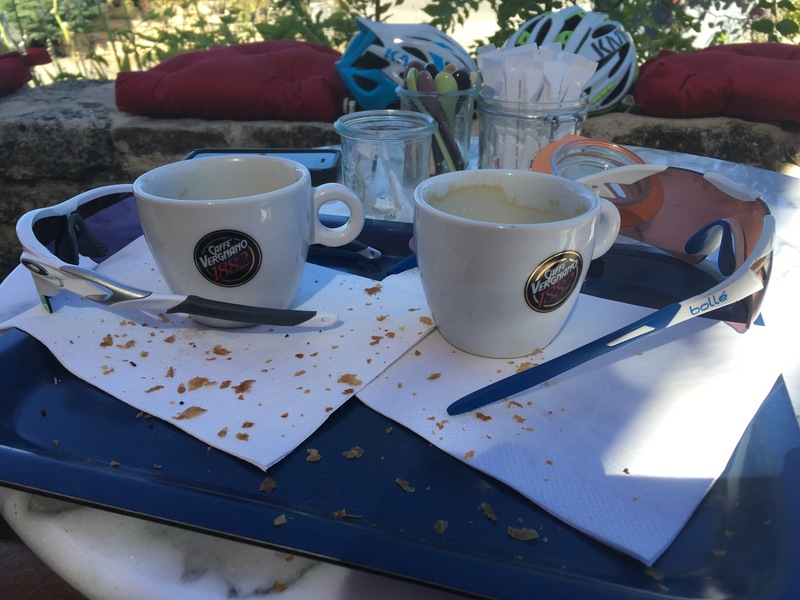 There’s always a friendly welcome and the coffee is served with a little handmade biscuit too ( just in case the pain au chocolat isn’t quite enough)……. It’s also a great community facility & in some ways a little bit like the community cafe in our village hall in Devon. 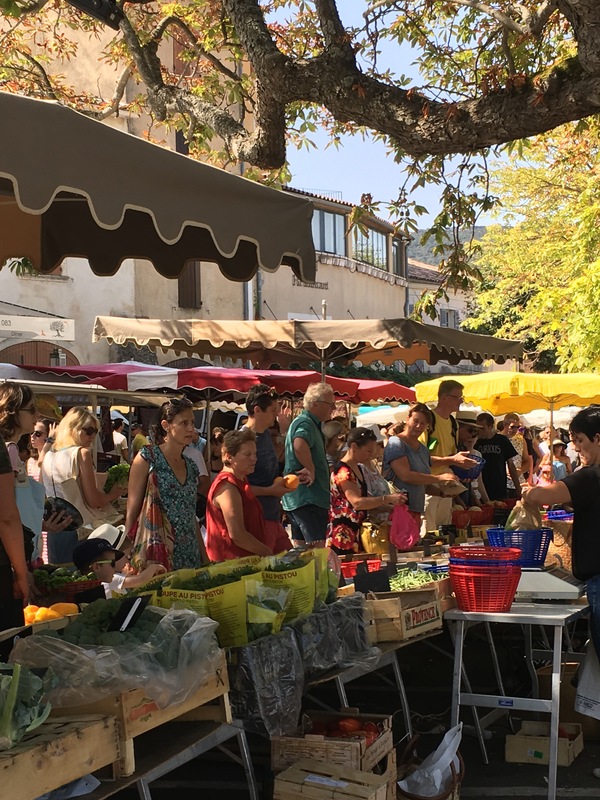 Every day the same people seem to come along for their café and sit and chat to their friends, perhaps choosing a melon from someone who is sitting with a tray of them at his table, or tomatoes from the back of a van that has parked just outside. It’s the perfect place to sit and start the day, even in the winter with its cosy, indoor Salon de Thé with a wonderful old oven against the wall. 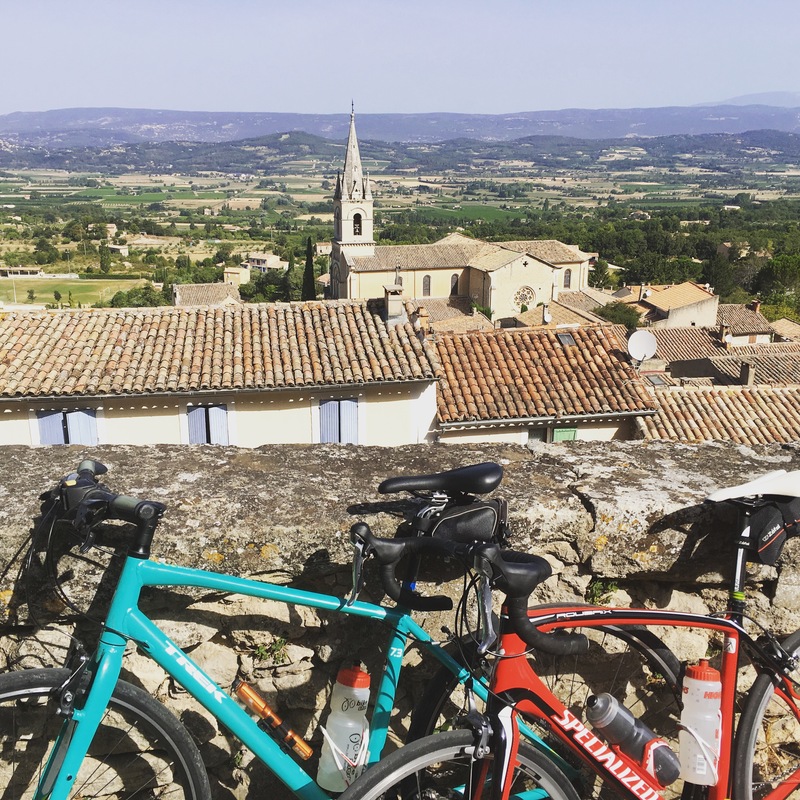 Whereas the cycle up to Simiane is a tough 12km, the cycle up to Bonnieux from Apt is the opposite and is one of our favourite morning rides. 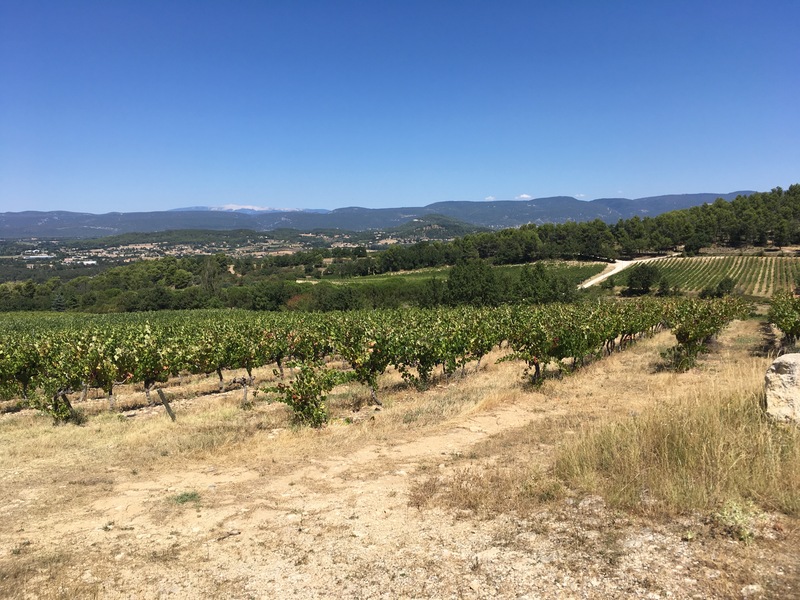 It’s still uphill, but this is a gentle, sweeping climb that tracks up the northern flank of the Petit Luberon, giving great views across the valley towards Mont Ventoux. 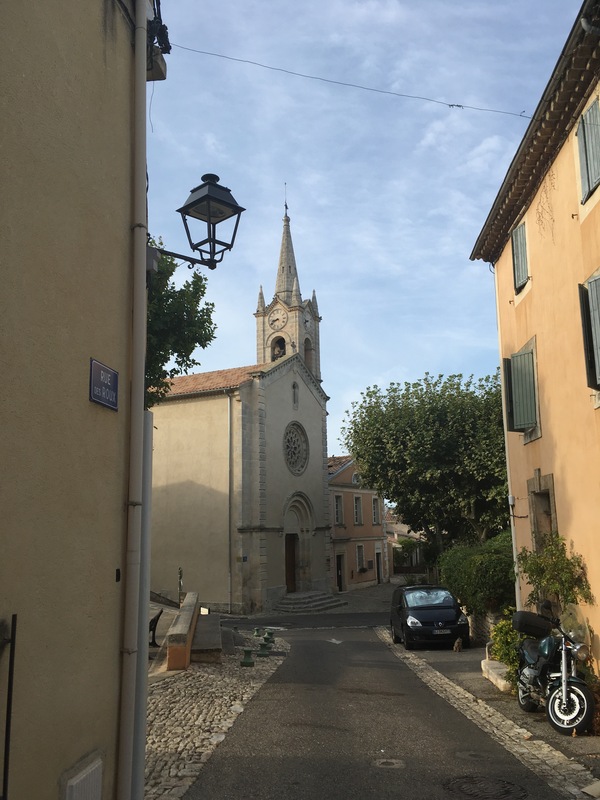 For anyone who has seen the film A Good Year then this is the road where Fanny Chenal falls off her bike, just here in fact……. 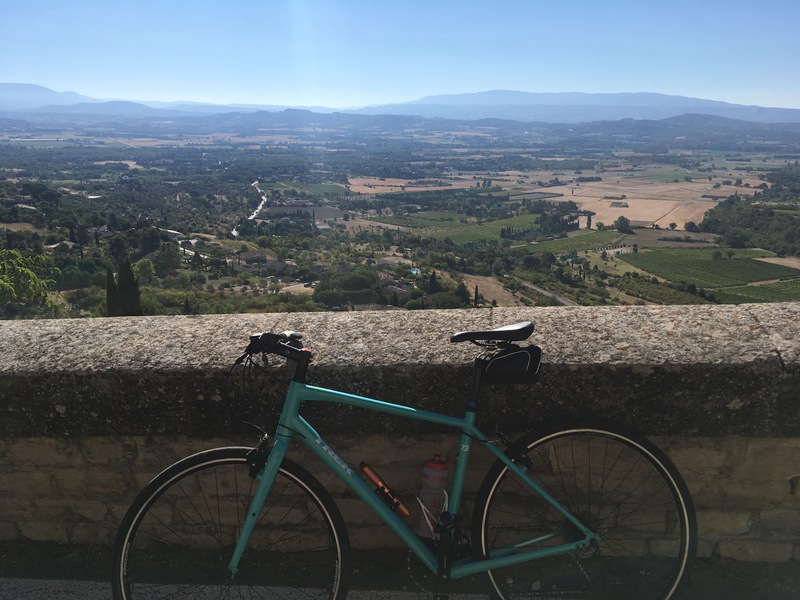 The ride takes you through vineyards, cherry orchards and pine woodland and is a perfect way to start a day. 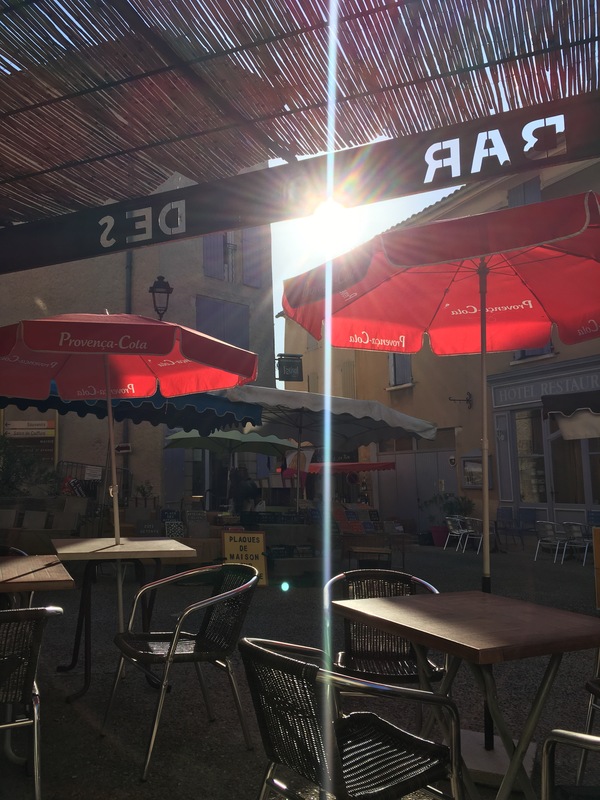 In Bonnieux we always buy croissants and pain au chocolat from the Boulangerie just off the roundabout by the Church and in Winter tend to have our coffee here too, as it’s warm and friendly with lots going on. In Summer though we walk up to the terrace of the Bar Le Terrail, situated to the side of the main car park / market square. 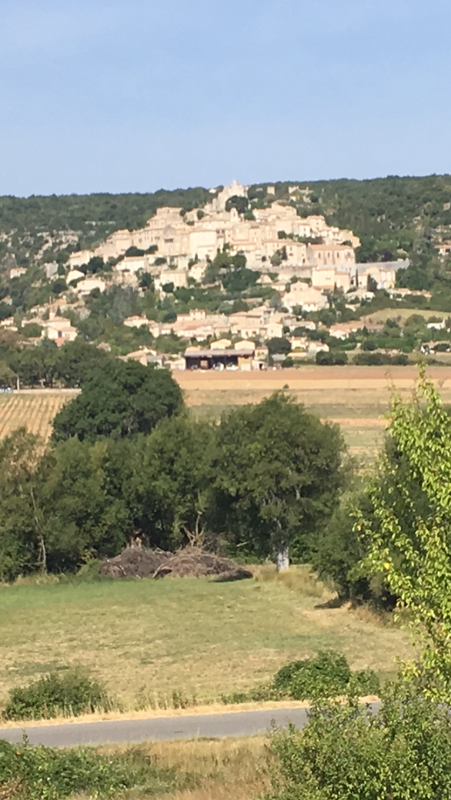 Here there’s a fantastic view across the valley towards Lacoste…..
….. and it’s a nice place to sit and watch the village come to life, especially on a Friday, which is market day…..
A sign perhaps that this is our most regular stop! 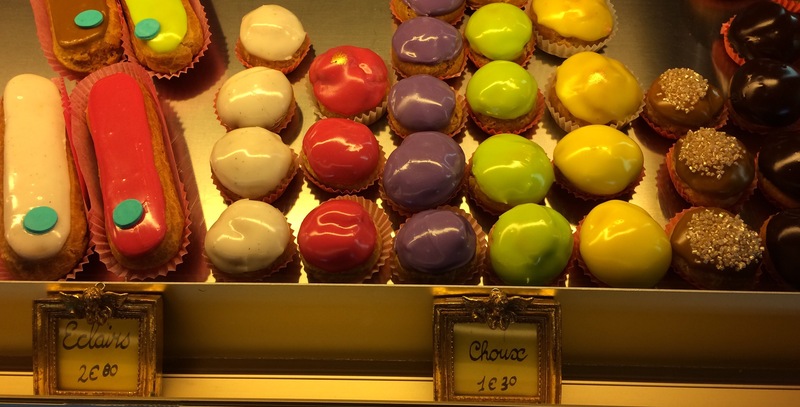 I do love the quiet village of Villars and the Boulangerie there is an experience all by itself. Again this is a place where we buy the croissants from the Boulangerie and head across to the local café for our coffee. The village always feels rather sleepy and has a really gentle feel about it first thing in the morning. 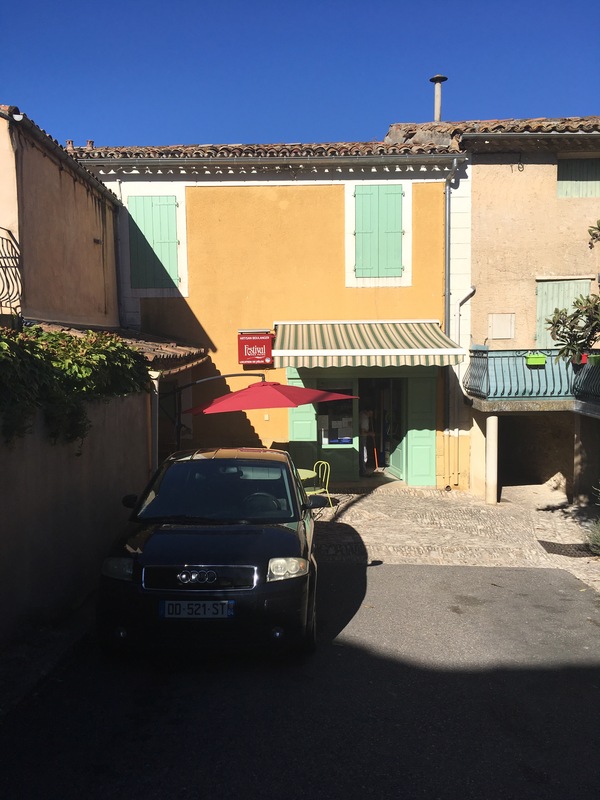 The Boulangerie is tucked away up the street to the left of the Village square and is perhaps the most quirky one we have come across. The shop is dominated by the massive wood-fired bread oven with its tiled front, situated on the left as you enter the shop. 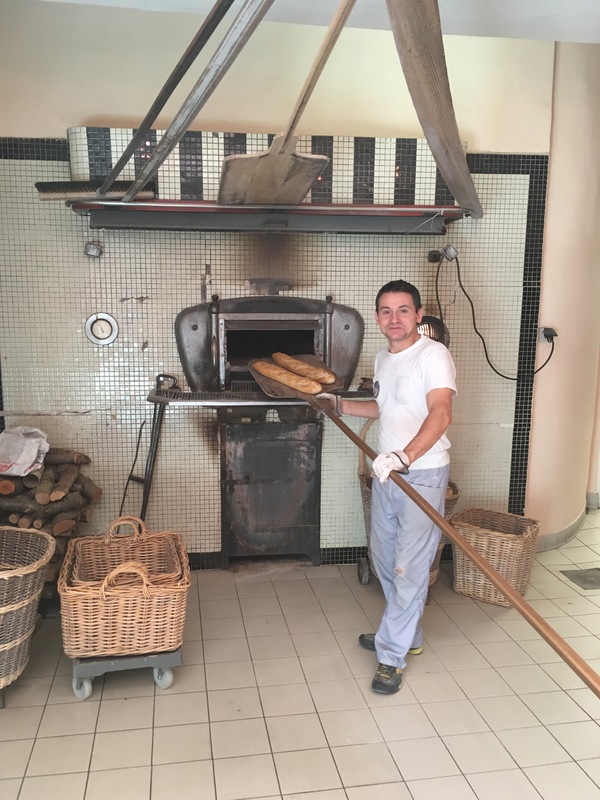 The counter is to the right, but taking up the whole width of the shop is the enormous ‘paddle’ that the Boulanger uses to place the bread in the oven and remove it again. To watch him in action is mesmerising, as the ‘paddle’ flies in and out of the oven with ease, placing loaves as it enters & coming out with different pieces on it to be placed on the racks to cool. As you stand ordering your bread you find yourself shifting your hips to allow the ‘paddle’s’ huge handle to fly between you & the counter. A real experience that is great to watch & was much to the amazement of a couple of American visitors when we popped in at the weekend. 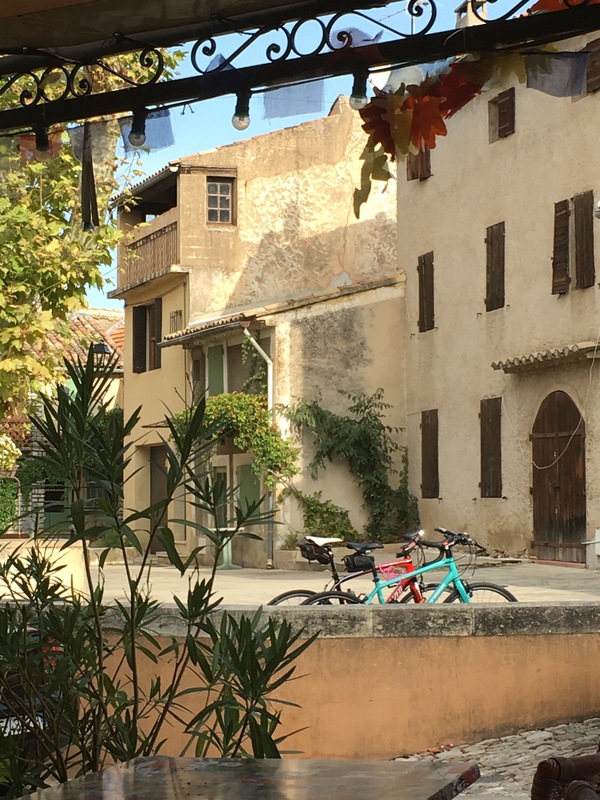 Coffee at the Bar Des Amis, overlooking the village square is always nice & we find it’s very easy to pass an hour just watching the village wake up. We tend to visit here when we’ve had a bit of a late start to the day as it’s only 35 mins from home, so is ideal if we’re not out of the house until 9! 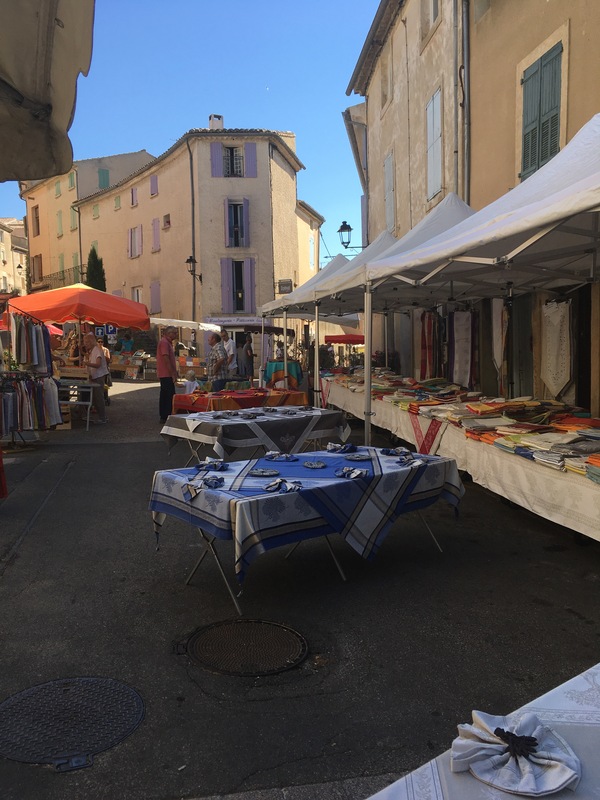 Tuesday is our favourite day for breakfast at Saint Saturnin, as it’s Market day in the village, which means there’s always plenty to watch. 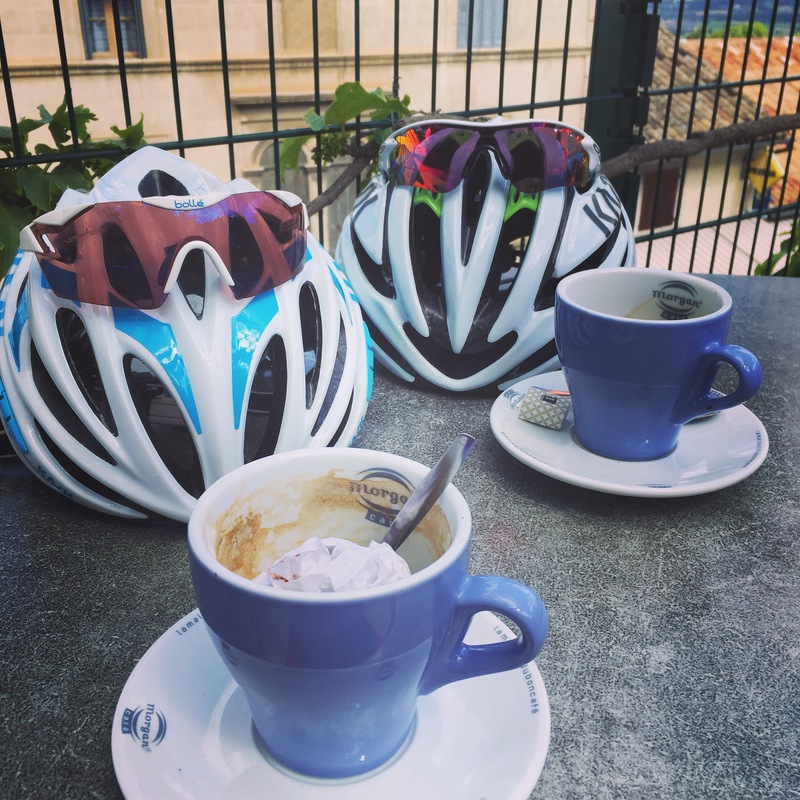 Although it’s also a good breakfast spot if we’re heading off on a longer ride across towards Sault, giving us that much needed caffeine and sugar burst before we start the big climb. 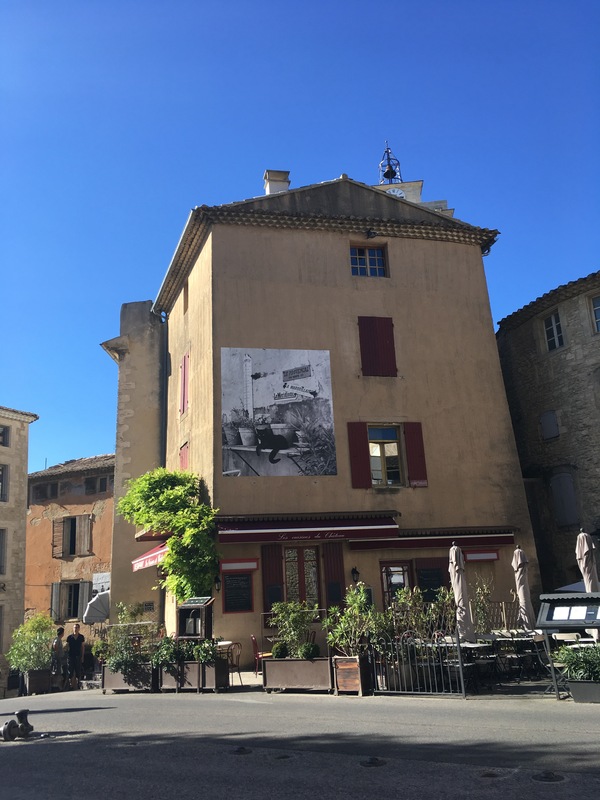 Again we buy our food from the Boulangerie in the main square, near the very moving Resistance Memorial, and head across to the Bar des Amis in the main street, finding a table in the corner of the shaded terrace to sit with our coffees. Again it’s a great place to sit and watch the world pass by. It’s friendly, well-placed and does a good coffee, so ticks all the boxes as far as we’re concerned! There are of course many other cafés & bars, but we still find we gravitate here and it’s become one of our more regular stops. 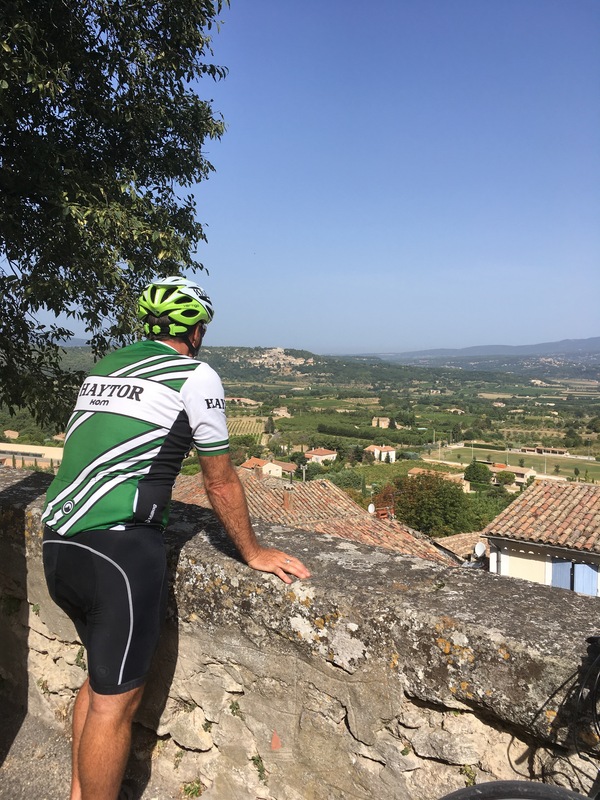 This is one of our furthest breakfast stops and we always feel like we’ve earned our rest by the time we get here as not only is it quite a distance away from home, it is also quite a considerable climb, whichever way we go. This is always an early morning stop, as it’s best to arrive before the town explodes with visitors. With that in mind Tuesday is not a good day as it’s market day and busy from first thing. The sheer joy of breakfast at Gordes for us is simply buying our Viennoiseries from the Boulangerie set below the Pharmacy behind the Chateau, together with a ‘double’ coffee from their little machine, then sitting on the stone seat that runs the length of the Chateau (next to the restaurant owned by Fanny in A Good Year). 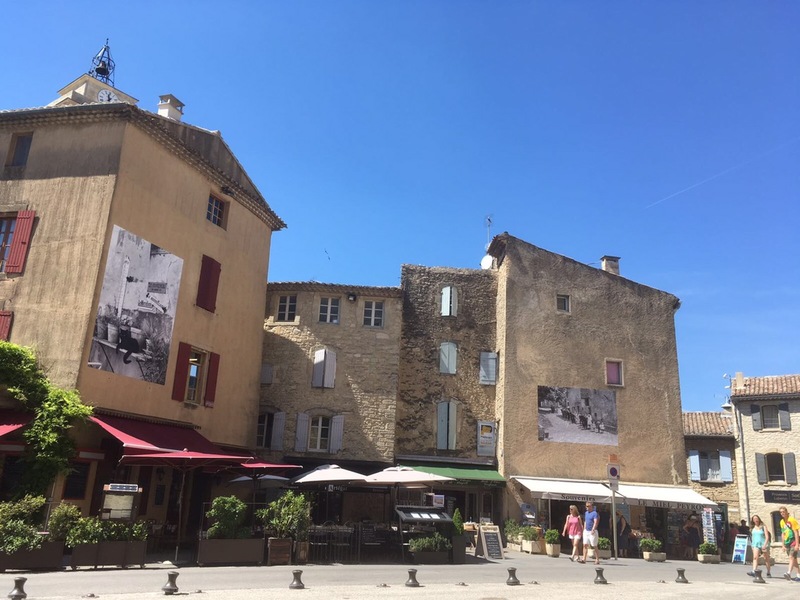 Andy and Tom say that the Boulangerie here has some of the best, if not the best Pain au Raisins in the area, so are always happy to stop and there is a real joy of just being able to sit in the beautiful village at this time of day, when it’s quiet and still has a slightly sleepy feel to it. This year the walls have been decorated with some stunning old black and white images and they’re easily missed when the village is busy. And there’s also a book exchange taking place with books left in baskets on the seats for you to read or take if you wish – again lost in the busy-ness of the day. 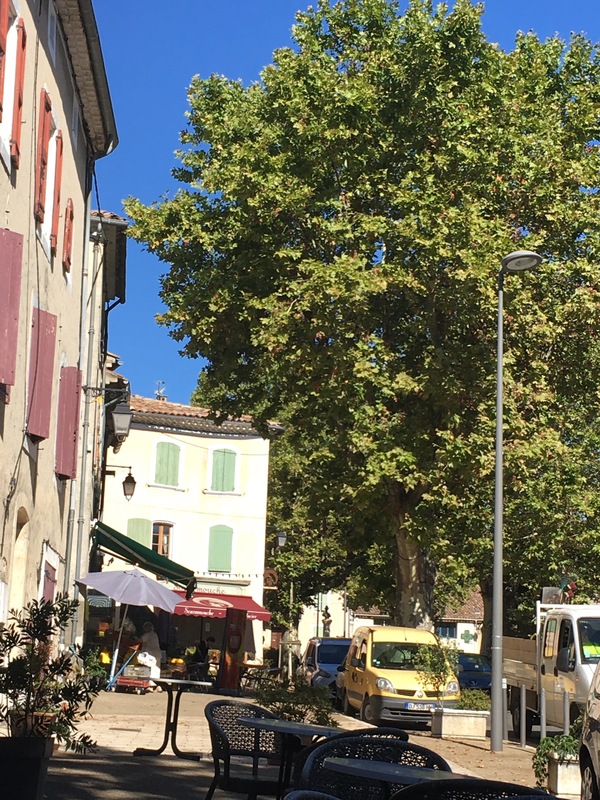 Since we first visited the area about 25 years ago Coustellet has changed considerably & is a thriving little place with the wonderful Véloroute du Calavon running right through its centre. 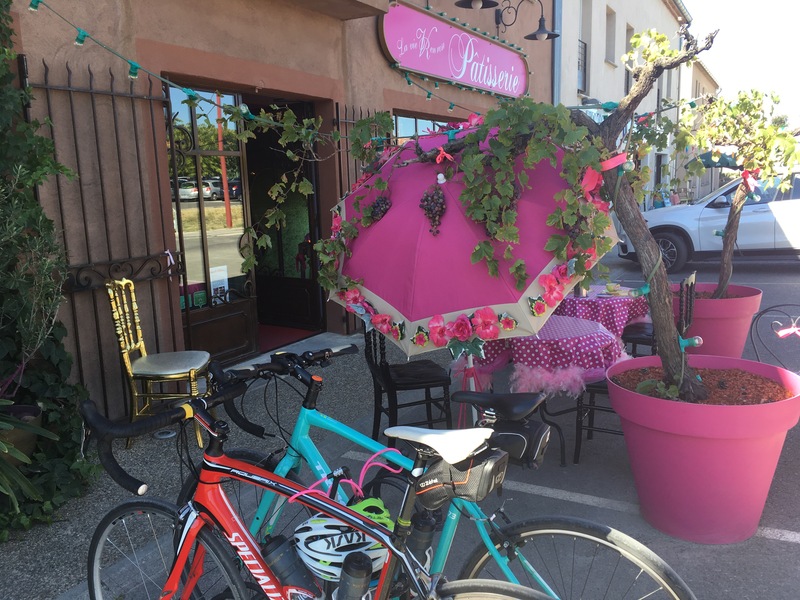 There is a wonderful Boulangerie on the main road, almost opposite Super U, but a breakfast spot of choice, especially in the Winter months is the quirky and bright La Vie en Rose. 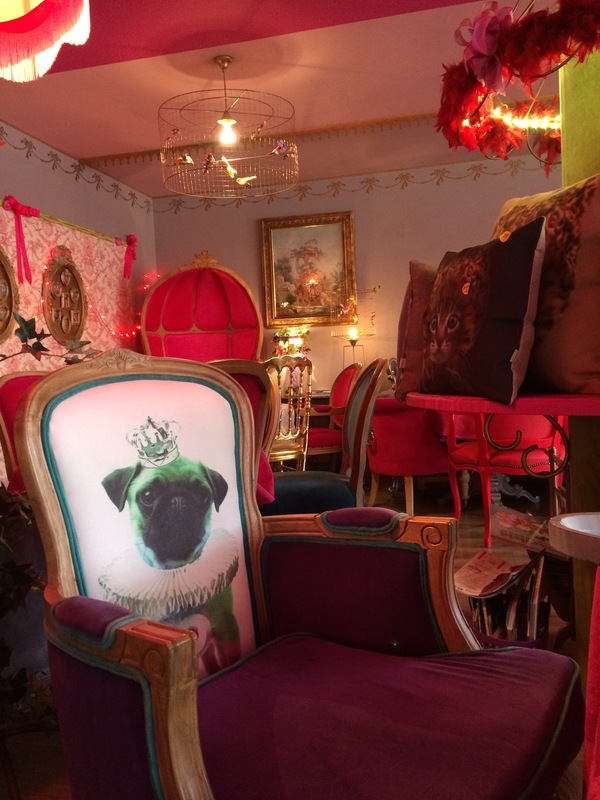 A chair decorated with a party pug – why not? 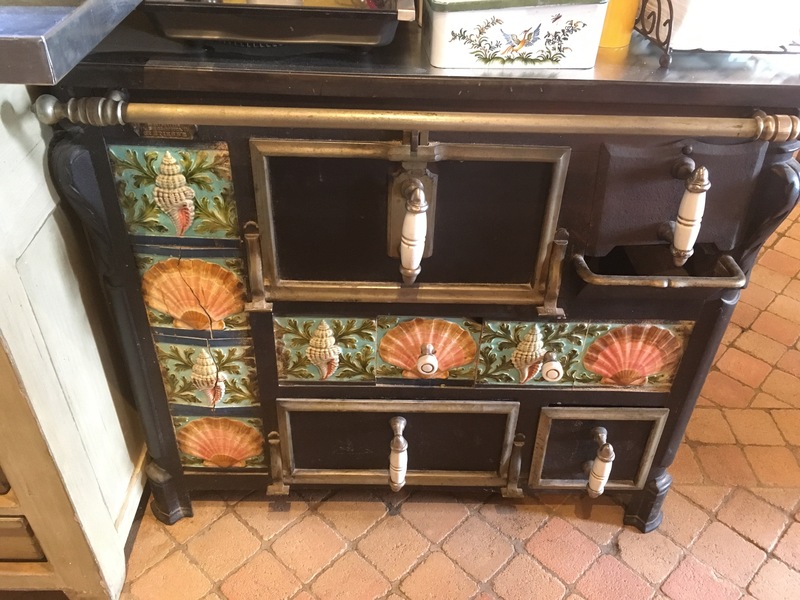 In the Summer we tend to stop for a late morning coffee and perhaps a little ‘choux’ just to get us home, sitting at one of the outside tables, currently covered in pink & white spotted cloths edged with pink feathers ……only at La Vie en Rose!!! Pink feather boas edge the tablecloths this year! But in the Winter the inside with its bright, comfortable chairs and friendly welcome is a perfect spot for breakfast offering the usual vienoisseries as well as particularly excellent coffee. Now which flavour to choose? 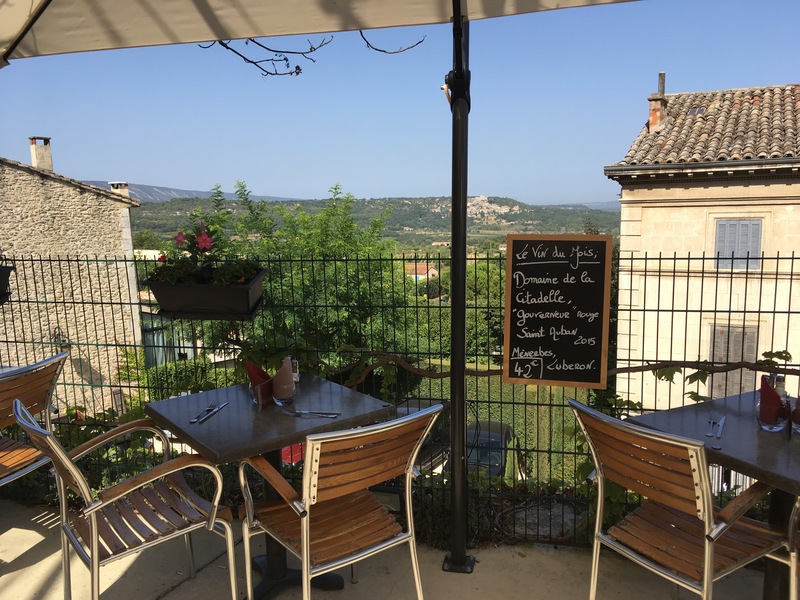 The great thing is that it is cycle-friendly and now has a cycle-rack outside too – it’s location makes it the ideal place to stop for a warm up either before heading on to Gordes & beyond or on the way back down. 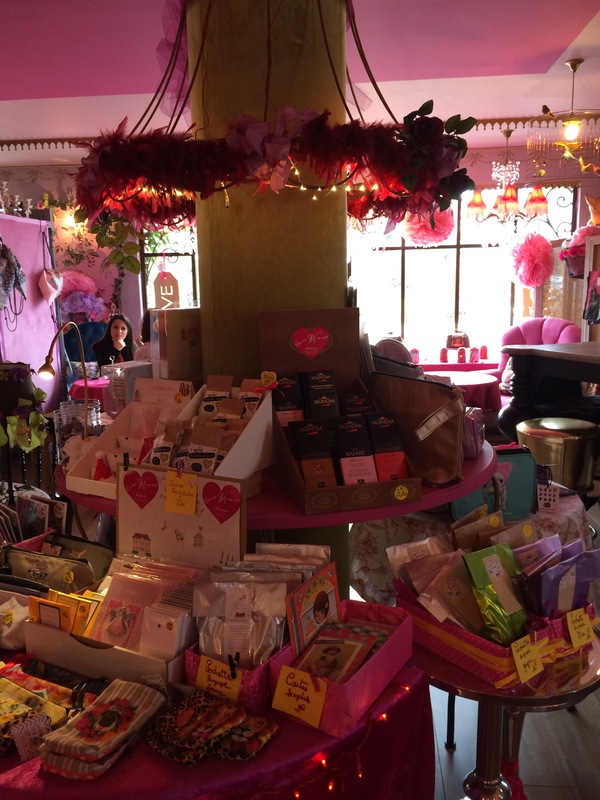 It may look a little frou-frou or as Tom put it ‘like you’re at The Mad Hatter’s Tea Party’, but it’s certainly worth a visit. 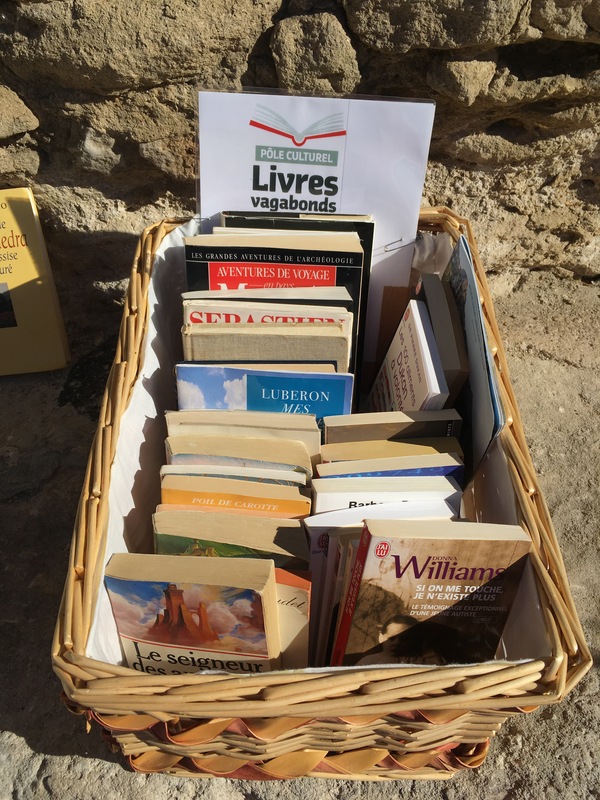 These are some of our favourites, although there are others, such as the great little Epicerie at Murs, which is a Depot de Pain for the Boulangerie de Mamie Jane in Gordes …..
Or the nice café on the street in Cereste, where you can get a good coffee to drink with a croissant picked up from the little Boulangerie in the square by the roundabout….. 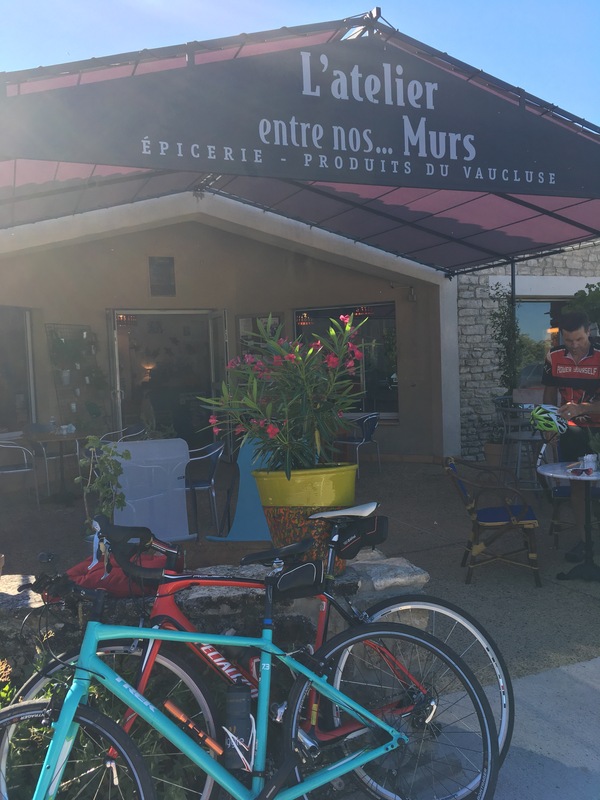 The simple fact is that there are so many great places to stop for breakfast and cycling allows us to have a guilt-free croissant every time we head out. 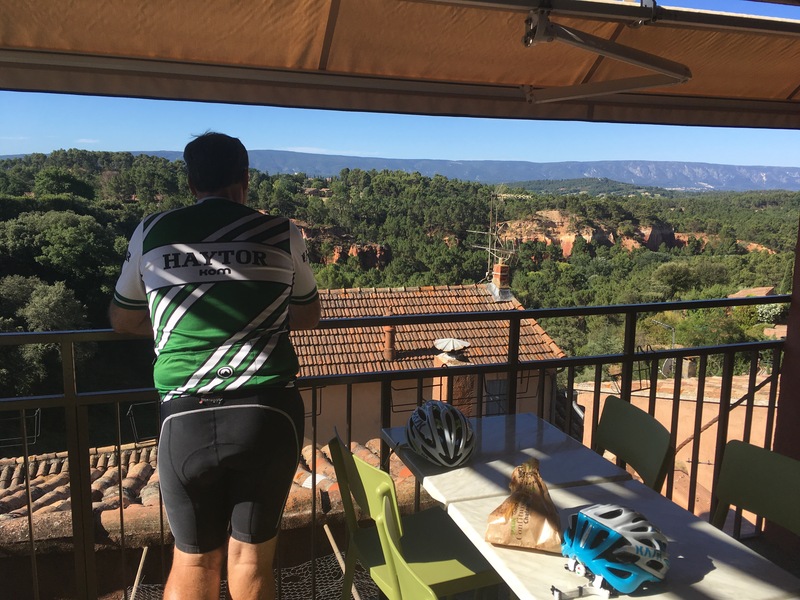 Bizarrely we’d both rather cycle out for breakfast than have an evening meal out – I’m sure that makes us a little bit odd! But 2000km so far this month & I’m sure we’ll add a few more to that in the next week – now where to go tomorrow? Next Post And Pusscat came too…..